We are proud to offer high-quality organic lamb meat to customers of many tastes. From traditional cuts to specialty items, we have something for everyone. 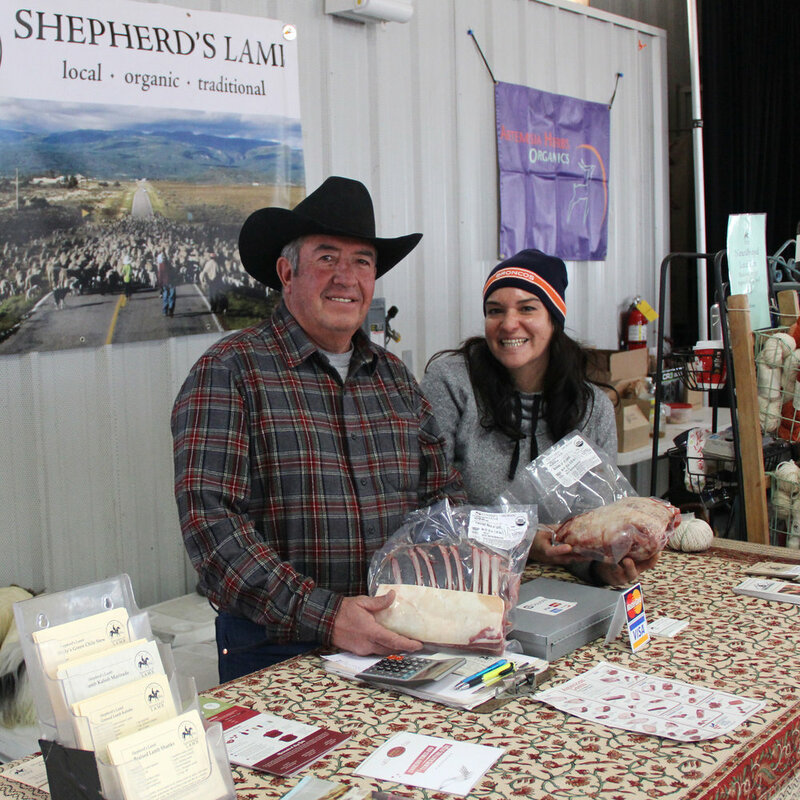 Antonio and Olivia showcase Shepherd's Lamb at the Santa Fe Farmers Market. As the sole Certified Organic lamb producer in New Mexico, Shepherd's Lamb is proud to offer high-quality lamb to customers of many tastes. From traditional meat cuts (chops, legs, shanks, etc.) to specialty items like bones, sweetbreads, and organ meats, we have something for everyone. Unlike many factory-farmed animals, our lambs are never finished in a feedlot. Instead, they spend their entire lives browsing on the open range. In the spring, the flock eats shoots of wheat, grass and sand dropseed. Later, on the summer range in the Carson National Forest, the lambs eat plumajillo (yarrow), palo rosario (snowberry), Arizona fescue and mountain mahogany. Because sheep are browsers and not grazers, their diet is varied: they enjoy eating not only grass but also buds and many leaves, especially aspen. Due to the flock's diet and relatively stress-free life, Shepherd's Lamb meat has become known for its incredibly mild and tender taste. Unlike imported lamb, which is wet-aged in Cryovac on its way to the United States and becomes soft, spongy, and limp, Shepherd's Lamb is pasture-fed and fresh, exhibiting a clean, meaty, firm texture. Our daughter Debbie Ripley ordered a “frozen lamb in a box” for our Christmas present. We now live in Arkansas, so seldom get a chance to eat lamb. This is, by far, the best gift ever. Your lamb is beyond outstanding. Had guests for dinner and everyone raved about the leg of lamb served. Thanks again for a fabulous gift. The Santa Fe Farmers Market is our primary retail location. You can find Antonio and his sales team at the market most Saturdays with a supply of choice meat cuts, lamb pelts, and yarn. The team loves meeting new customers, so don't be shy! Click here for Farmers Market info and directions. If you can't make it to Santa Fe for the market or would like to order a whole lamb, please contact us at (575) 588-7792 or shepherd@organiclamb.com to place your order. We ship to domestic and international locations around the world. Shepherd's Lamb is proud to have a 12-year (and going!) partnership with La Montañita Coop, New Mexico's largest community-owned natural foods market. Our cuts can be found behind the meat counter regularly at La Montañita's Santa Fe location. Click here for La Montañita Coop information and directions. You can find Antonio and his sales team most Saturdays at the Santa Fe Farmers Market.